KAITLIN Doherty from Scoil Mhuire in Buncrana has beaten off competition from more than 700 students across Europe to win top prize in a European schools slogan competition. The competition aims to foster an interest and awareness of topics such as climate change, human rights and recycling. Kaitlin's winning slogan was: “Don’t put your feet up - Help stop the heat-up” saw her claim the winning prize of an iPad Air. 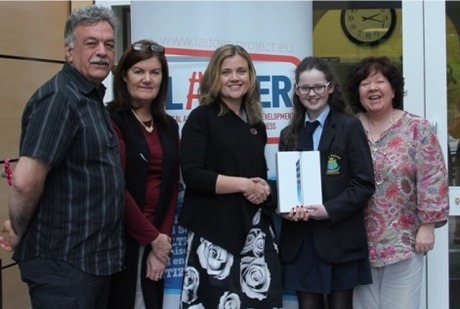 She was one of only five winners of iPads across Europe from 773 submissions. Two other students from Scoil Mhuire in Buncrana were highly commended by the judging panel and all three of their selected slogans will be used by the competition organisers. Scoil Mhuire student Kaitlin Doherty who won an EU schools slogan competition pictured being presented with her prize from Joanne Kilmartin of Donegal County Council's Social Inclusion Unit. Also in the photo is school principal Rosaleen Grant, teacher Marie Boyce and Patsy Toland of Gorta Self Help Africa. The compeition is organised by ALDA, the European Association for Local Democracy and implemented by Donegal County Council through the EU LADDER Project. Local co-ordinator Joanne Kilmartin said Donegal County Council was proud to have three slogans selected by the European judging panel. "The project has successfully delivered a number of training sessions for local citizens in conjunction with Patsy Toland, Gorta Self Help Africa and the Change Makers Project,” she said. Donegal County Council is the only Irish local authority participating in the project.